Fed up with the lack of attention on his Carrick street, Neal Hinterlang felt the only way to overcome the disastrous January blizzard was to purchase new snow tires. Anthony Coghill. Photo from City of Pittsburgh website. Kate Freeman described a similar public works issue when her front tire hit a large pothole driving on Mt. Joseph Street and had to have the tire replaced. 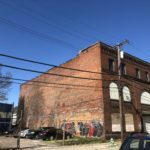 Donna McManus, who leads the block drug watch for councilman Anthony Coghill’s district, was upset when city officials didn’t deliver on promises to demolish several abandoned buildings that had become drug dens. These are three of the main issues Mr. Coghill campaigned for in November, promising District 4 constituents his administration would be getting “Back to Basics,” a slogan he has emphasized over the last few years. Coghill lost the last three District 4 council elections before finally winning a seat after Natalia Rudiak decided not to seek re-election. He considered that campaign likely the last time he would seek office. “This is the only job that I have ever wanted in politics,” he said. Coghill, a former contractor, is a resident of Beechview and graduate of Brashear High School. He owns Coghill Roofing Company, located on Wenzell Avenue. Prior to his campaign, he worked on house roofs and garages for 20 years. His brother is a police officer and was able to see first-hand what law enforcement does. This inspired him to become a community advocate, pushing for leaders to develop close relationships with those who serve in public office. 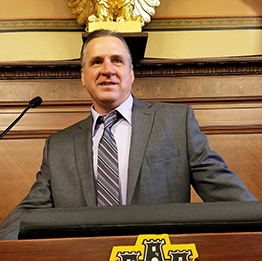 The snow and pothole issues inspired Mr. Coghill to bring back a public works division to the South Hills so city workers are close to the problems. Coghill’s idea is to rebuild a public works division in McKinley Park in Beltzhoover. When he took office in January, he was faced with hundreds of calls about streets not cleared due to the severity of a Jan. 13th snowstorm, the councilman explained. “The mayor [Bill Peduto] said that I had to show him the data to have a new structure built, and the 500 calls that I fielded during that time ended up sealing the deal. Without them, none of this would be possible,” Mr. Coghill said. Neal Hinterlang is welcome to the change, but still feels that time would be wasted with salt trucks from one district location. He learned to love driving in these conditions after years of sliding on his surrounding roads. Lutz Street, where Mr. Hinterlang lives, is not a main road that gets much attention, so he took action into his own hands. When asked if he knew about the idea to build a McKinley Park Public Works headquarters for the district, he was in favor of the change but would like Carrick to implement its own plowing. “I think every community needs some kind of division. Time is wasted going back and forth with these trucks reloading,” he said. Like Mr. Hinterlang, Jason Viglietta, of Brookline, was content with the timeline given to him after it took several calls from him and his mother to get Oakridge Street plowed. He has an elderly mother and said when the streets get bad, mostly around the Brookline Recreation Center, it is impossible to drive without risking accidents. Mr. Viglietta worked one-on-one with Mr. Coghill’s Chief of Staff Moira Kaleida, to ensure that his streets were being cleaned well and timely. Moira Kaleida – Anthony Coghill’s Chief of Staff. Photo by James Kail. After holding a meeting in the midst of the winter storms with the Mayor’s Chief of Staff Dan Gilman, Mrs. Kaleida felt that the South Hills area is unfairly ignored during heavy storms and was able to get Districts 3 and 5 to both work with her and Mr. Coghill in regards to the structure at McKinley Park. “It’s hard to maintain a part of the city you’re not in,” Mrs. Kaleida said. Mrs. Kaleida said that the Western Pennsylvania laborers were responsible for covering one big area but lacked staff. She believes it isn’t an issue of lazy workers or just calling off because these employees are working 12-15 hour shifts in the cold. Mr. Coghill is optimistic about getting the new structure built this year, possibly within the next few months. He said the money has already been secured and it will not be anything huge or spectacular but will get the job done. The condemned building has been idled for at least 30 years. Mr. Coghill drew up the plans himself after showing the mayor all of the complaints and it was approved immediately, said the councilman. While snow remains a top priority for the team, April will shift focus to fixing potholes in some of the worst areas in District 4. Kate Freeman was upset to learn she would have to buy a brand-new tire after passing over a crater nearby Volunteers Field. She attends Robert Morris University and said this district is the worst along her route to school when it comes to maintaining safe, pothole-free roads. Sarah Kohnen agreed with Ms. Freeman’s assessment of the area and recalled an event where she witnessed a car approach a pothole slowly and end up with its front right tire stuck, unable to get out. She is noticing more and more roads not getting repaired. “It looked like a regular puddle and the person had a nice Jeep. The problem is that the city does half-assed jobs patching these things to save money instead of just smoothing a road,” Ms. Kohnen said. Mr. Coghill believes that the new structure being built will also get roads fixed in a timely manner. Drugs and crime remain a longer-term goal but are still an important part of creating a safer district in the administration’s “basic needs” agenda. To help keep track of these issues, Mr. Coghill hosts a monthly public safety meeting at Concord Elementary School in Carrick. Resident Donna McManus recalled a recent event when a nearby abandoned structure became a hotbed of drug activity because it was not torn down. Ms. McManus had called Maura Kennedy, who works with the City of Pittsburgh in the Department of Inspections and Permits and had reported the building numerous times. She said she was promised the site would be checked and demolished if necessary. Nothing was ever done about it according to Ms. McManus. “She said that there was no issue with money for demolition, but it was never destroyed and it was a horrendous property sitting there,” Ms. McManus said. “There was some questionable stuff going on,” intimating that drugs may be growing there. Maria Bethel, who works at the Department of Public Safety was also in attendance at the meeting and told Ms. McManus that the website has a tracker on the City of Pittsburgh website and reporting incidents of drug activity on there, especially with vacant properties, can help even more with catching these people. Maria Bethel of the Public Safety Department. Photo by James Kail. In addition, at the meeting, Zone 3 Police Officer Christine Luffey, admitted that the opioid crisis is by no means over, but said that this year alone, the numbers have been significantly better in regards to overdoses and drug activity. She described an incident regarding domestic abuse and marijuana growth that happened just recently and the SWAT team was called in promptly and arrested the individuals. “On February 12th, at 3:30 in the afternoon, our officers received a call from a concerned neighbor that a male inside the house had weapons and drugs. When the officers broke in the door, they discovered 30 mason jars of marijuana growing in the basement,” Mrs. Luffey said. According to a police report for 2018, from Jan. 1 to Mar. 5, there were a total of 91 opioid overdoses in the city, 17 were fatal. That has decreased significantly from the same time period for 2017, where there were 296, of which 36 were fatal. Carrick was found to have the second most out of all of the Zone 3 Neighborhoods with six overdoses. Mr. Coghill believes he can tackle the drug issue hands-on, beginning with targeting young students in schools and then turn a focus to meeting with people who rent out buildings. The councilman said that drugs are often overlooked and that talking about the issue will build a trust and he will be able to refer them to good resources. Mr. Coghill said he believes he can bring change to these communities, and that through his campaign, he has gotten to personally know many people. In general, Mr. Coghill wants to see a strong emphasis on bringing the community together going forward. “We have knocked on over 10,000 doors total and I am confident that I know our people better than anyone. Our basic needs are going to be met,” Mr. Coghill said.